Looks fun to me too! Liked the bulb wave effect! Looks nice. I like the art direction you went for ! I'm glad to hear that people like the look. I was worried that the black and grey didn't convey the "weird and dangerous game show" vibe that I was going for. I've been tinkering with the character randomizer recently. Essentially, the head, hair, and facial features are all separate sprites that I can combine in any way I want. I created a game state that just generates 60 of them at random, and it's pretty great. 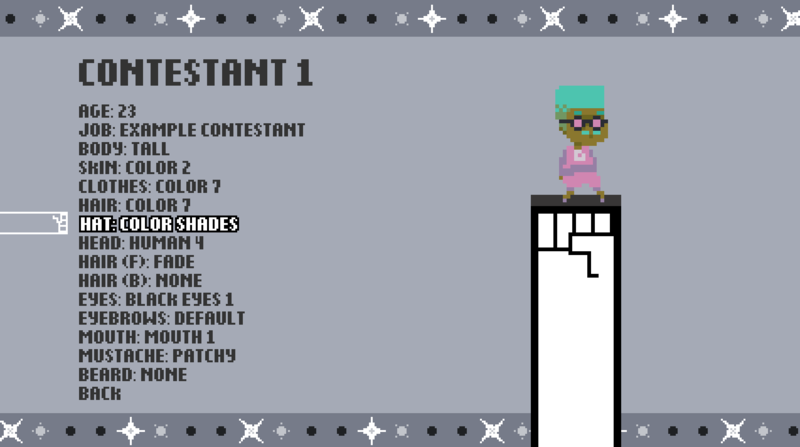 I forgot to mention, it's also possible to create your own contestants using this menu screen. You can create yourself and your friends and put them in the tower as well. You use the coins you earn in-game to unlock more customizations, such as hats or crazy skin colors (ie: robot, zombie, or super neon green, as seen in the last post). This is actually what I used to create my current avatar! I've made a number of visual changes since the version of the game I posted gifs of originally. For one, to make it obvious that you aren't supposed to touch the floor after jumping on an enemy, the whole floor sparks up with electricity, reserving the "red light" effect for when you get eliminated. Also, there are borders on the map (which I had to manually do, since the incorporating fists as sprites means I couldn't auto/alt map it). I'll probably keep the minimalist black tileset as an unlockable or something. I also streamlined the HUD, so that you only see the time in the upper corner, and the lives/coins only show up when you lose or get them respectively. My maps play pretty close to the edges, so it was either re-do all the maps, change the whole game's resolution, or make the HUD as unobtrusive as possible, and I went with the latter. I put together a trailer for Fist's Elimination Tower, and you can watch it here! Fist's Elimination Tower is now on Steam Greenlight! Hopefully I can get in just before Greenlight goes down forever. Click here to vote for it! Whoops, I haven't been updating for a while. Anyway, since last time, the game got greenlit, I redesigned the enemy sprites, improved particle effects (enemies now explode into randomly-chosen chunks of nuts/bolts, money, confetti, etc), and each floor has a time limit. I'm sure I'm forgetting a lot of things, which I'll hopefully mention in later posts. Oh, did I mention that you can play as a horse sometimes? @starry-abyss Haha, now I'm just reminded of that picture of a dog wearing a horse mask. I finished the last pre-launch trailer for the game last week - you can see it here. It quickly goes through a lot of the new things I added to the game, which will hopefully be out later this month! I really should be focusing on wrapping up the game, but instead I added a drop button that cancels your jump and also throws confetti (partially as a visual indicator that it happened, partially because it looks really neat). Should make for some interesting speedruns of the game.